Stuart Tracy left behind the hustle and bustle of restaurants for a different kind of kitchen—one that reaches far and wide. Fast forward a baby later, Tracy is now senior culinary lead developer on Chick-fil-A’s Culinary and Commercialization team, helping to innovate and improve menu items. And he hasn’t looked back since. Enter his newest “other” baby: Chick-fil-A’s Mealtime Kits, testing in Atlanta from August to November 2018. The kits will allow customers to pick up pre-portioned ingredients to cook an easy, 30-minute meal at home, from Chicken Enchiladas to Chicken Parmesan. Tracy’s cooking style? “I try to make food that’s delicious but not strange – I want something that people feel is approachable,” he says. And that’s something he applied directly during the development of the new Mealtime Kits. This philosophy is something he’s been honing since the age of 14 during his first job at Harry’s Farmers Market near Atlanta, where he grew up. 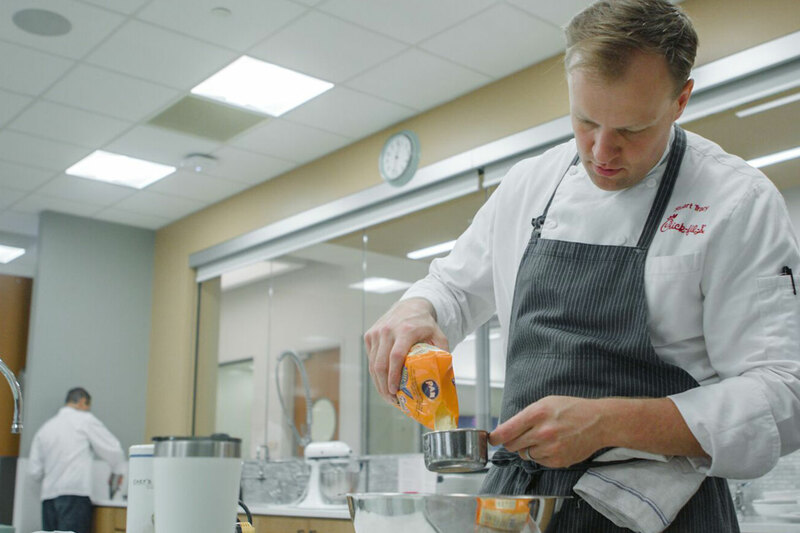 From there, his interest in food took him to Johnson & Wales College of Culinary Arts in Charlotte, North Carolina, where he dreamt of becoming a television chef, inspired by the likes of Emeril Lagasse. Tracy put in his time, working his way up from a dishwasher at Outback Steakhouse to a chef at multiple higher-end restaurants near Charleston. All his hard work led to the opening of Butcher & Bee in 2011, a craft sandwich restaurant known for local farm-to-table produce, where he served as part owner and chef. After leaving Butcher & Bee in 2015, Tracy moved back to Atlanta to take on an executive chef role at Parish, where he spent nearly three years. Now close to a year into his role at Chick-fil-A, he’s bringing his past knowledge to develop tomorrow’s menu items. “What I learned with Butcher & Bee was the importance of making simple food feel elegant, and that’s something I’d like to continue to bring to Chick-fil-A,” says Tracy.